Three Ghost Friends: FREE Printable Halloween Thank You Notes! 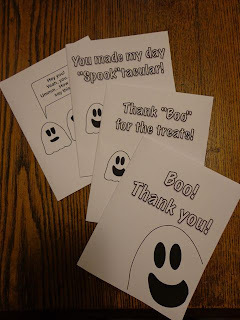 FREE Printable Halloween Thank You Notes! Download and print Three Ghost Friends Halloween Thank You notes to tell your friends and family how much you appreciated their Halloween treats! Directions: Download, print, fold in half, and then fold in half again. Smile on my Face - Download Now! Happy in Happy Halloween - Download Now! You are FaBOOlous! - Download Now!